My childhood stocking had holly leaves on it. Although theoretically my two sisters and I were free to choose a new stocking every Christmas, we always ended up picking the same ones… year after year. My little sister’s was red with a Christmas tree and beads sewn on as ornaments. My older sister went with the more subdued but dignified red and white striped one. Who knows if those were the stockings they actually prefered. As I grow older I’m finding that apparently I’m much more sentimental about such things and perhaps they didn’t care but let me have the holly stocking because I did care. Tightly crocheted, those stockings endured with nary a pill Christmas after Christmas. My mother still has them tucked away even if they don’t make an appearance every year. In my husband’s family every Christmas morning started off with emptying a stocking, a ritual which has endured to this day. Each family member – even the adults – get one. I don’t remember my parents ever having stockings, so the idea of getting one as an adult was rather shocking. Over the years though, I’ve been amused by what pops up in them. For example, the kids usually get oranges, but the adults might get avocados, a potato, or an onion… there’s a rumor that I might find a pomegranate in mine next year. Even though having a stocking as an adult has never been terribly important to me, it is to my husband. When the Engineer and I were still collecting Christmas decorations early on, the only stockings we had were small decorative ones. His parents always provided stockings when we celebrated with them, but since we had none of our own I decided to make him one. From Left, the Engineer’s, Little Elf’s, Munchkin’s, and mine. Back then my stocking-making plans included extended family, but, as is usual in the month of December, I found that my to do list exceeded my hours free list and most of the stockings were put on the back burner. I did finish my husband’s that year… but that was it. After Munchkin came, I managed to finish his for his first Christmas. I always intended to make mine in time for the holiday… but something else always took precedence. This year I worked hard to finish Little Elf’s before Christmas, and thought I’d have enough time to finish mine too… but it didn’t happen. In the aftermath of the holiday I am usually so happy to have nothing pressing that I take a few weeks off and pack things up. By the time that is over I am no longer in a Christmas-y mood and working on a stocking seems silly. I put it off until next year and then, of course, the busy season consumes my free time. Well, I’m happy to report that mine is finally finished! It has been four years in the making and the credit goes entirely to my husband for insisting that I finish it before putting in a single stitch on something else. I did make it, but without his push it wouldn’t have happened. Here’s to next year… and a pomegranate! They’re so pretty! I want to crochet stockings for us … or knit. But like you, I always get too busy. I’ll have to put it on my to-do list for projects this summer that aren’t too big and hot to carry around. Thank you! Isn’t it funny how those of us that make things are always swamped come December? Yes, they are beautiful! 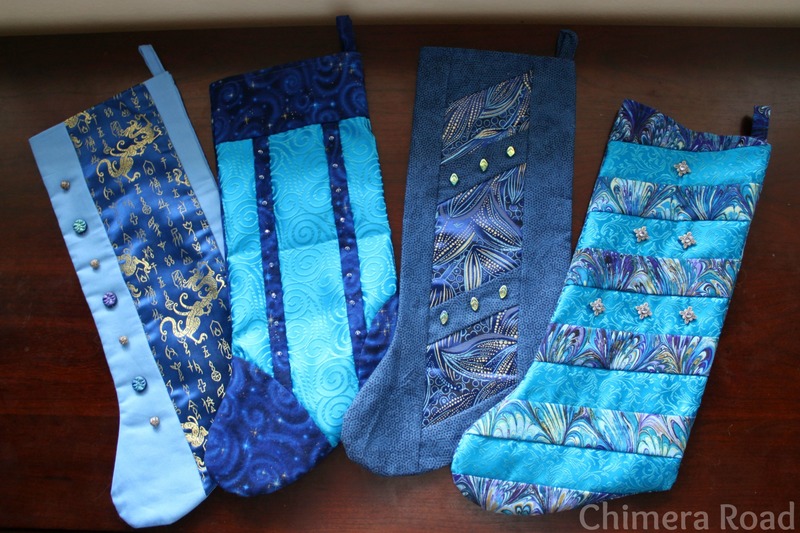 Both my mom & James’ mom have made us stockings… I feel very lucky!